This ensemble brought together a hotel, an exhibition and office section and a wide-screen cinema (screen dimensions 23 x 19 metres). It obeys both the oblique building lines on site and its own orthogonal grid, hence the intriguing basic form. The hotel has six upper storeys, each with 25 double rooms, a restaurant on the ground floor, and a conference section with a swimming pool and 'sky bar' on the projecting topmost level. 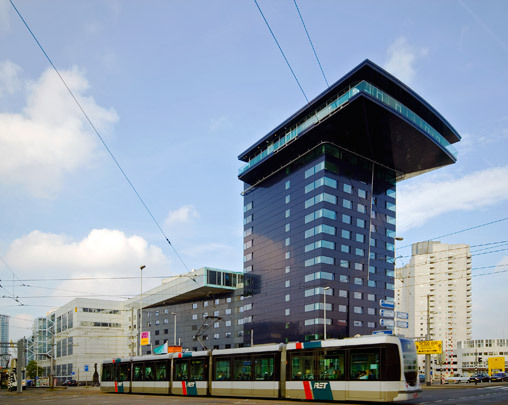 In 2006 the hotel was extended with a high-rise portion along Maasboulevard. The cinema and exhibition areas are demolished in 2011 and replaced by a new extension of the hotel.